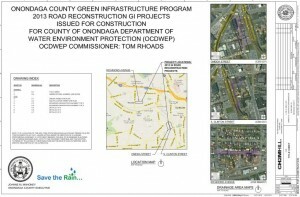 The Oneida Street Road Reconstruction Project exemplifies the continued partnership between the City of Syracuse and Onondaga County through the Save the Rain Program. 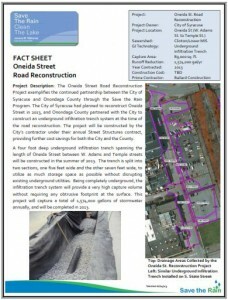 The City of Syracuse had planned to reconstruct Oneida Street in 2013, and Onondaga County partnered with the City to construct an underground infiltration trench system at the time of the road reconstruction. 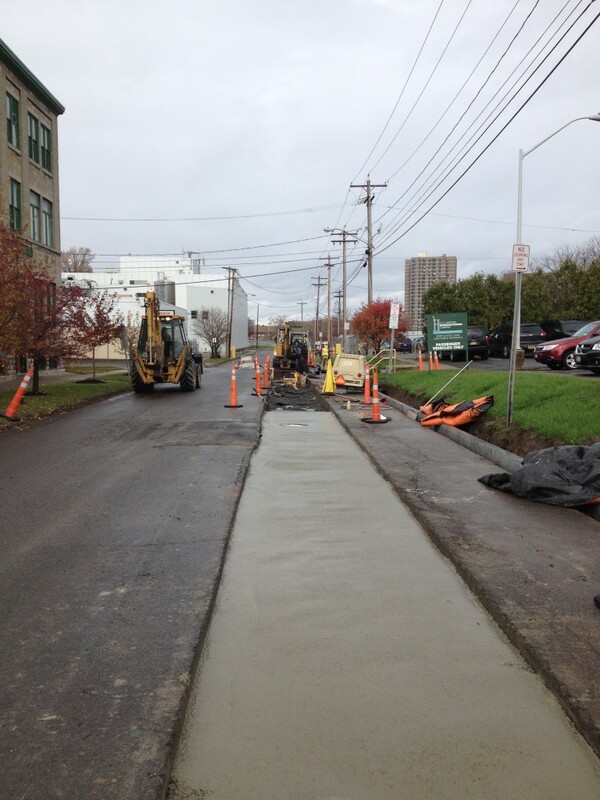 The project was constructed by the City’s contractor under their annual Street Structures contract, providing further cost savings for both the City and the County. A four foot deep underground infiltration trench spanning the length of Oneida Street between W. Adams and Temple streets was constructed in the summer of 2013. The trench is split into two sections, one five feet wide and the other seven feet wide, to utilize as much storage space as possible without disrupting existing underground utilities. Being completely underground, the infiltration trench system provides a very high capture volume without requiring any obtrusive footprint at the surface. This project captures a total of 1,574,000 gallons of stormwater annually, and was completed in 2013.